Health and PE Teachers Prepare Students to Live Their Best Life. SHAPE America believes that health and physical literacy can be a life-changer for all children. It’s a simple but powerful belief that drives everything we do. 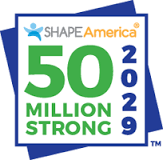 As an organization SHAPE America is committed to 50 Million Strong by 2029 our ongoing initiative to put all children on the path to health and physical literacy through effective health and physical education programs. KAHPERD is committed to 50 Million Strong by doing our part as members to impact the students in our state with quality instruction and to advocate to decision makers at all levels about the importance of prioritizing health literacy and physical literacy.